About a year ago I noted a crazy run-up in the stock price of Craft Brewers Alliance, the parent company of Widmer Brothers, headquartered at Widmer's North Portland facility. At the time, I was amazed that the stock price (ticker: HOOK) was climbing toward $4. Fast-forward a year, and in recent weeks it's been hovering around $9. Somewhere in between, I made a small investment in 115 shares of HOOK, ignoring my own advice about the risks involved. 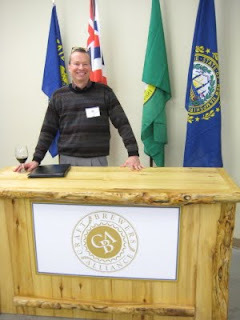 And so it was that yesterday I wandered over to Russell Street to attend the 2011 CBA Shareholders Meeting. It was a pretty civilized affair: Widmer Pitch Black IPA (formerly W'10) and Kona Longboard Lager were on tap, and chilled bottles of Red Hook Pilsner and Copper Hook were available. Shareholders were given a Widmer grocery sack and invited to pick up a nice "dividend" for attending the meeting: six-packs of the three CBA brands. Kurt Widmer ran the meeting with a glass of Pitch Black in hand, and Prosted us with it after the brief formal business portion of the meeting. There followed a Power Point presentation on the current marketing focus of the company. Widmer, Kona, and Red Hook -- the three brands that remain in CBA after the sale of Goose Island to InBev -- each fulfill a different goal for the company. Kona has great summer seasonal sales as beachgoers try to recapture that island feeling from past Hawaiian vacations (marketing speak: Liquid Aloha). 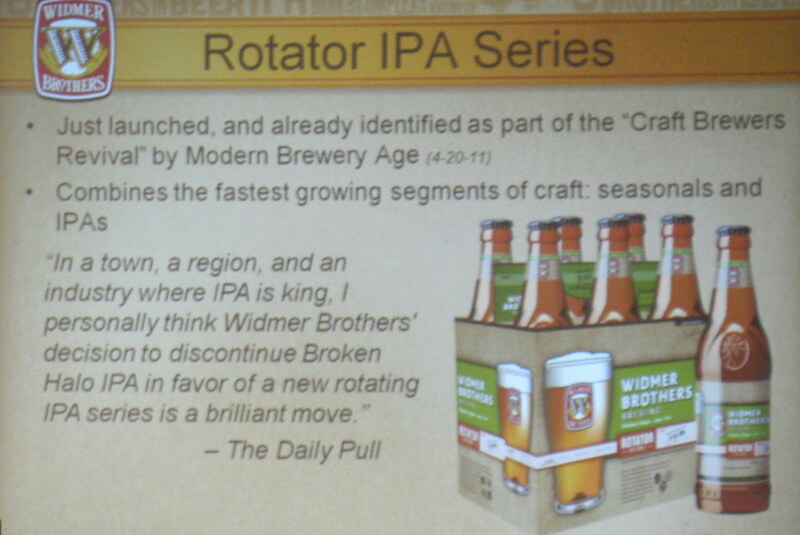 The Widmer brand aims to provide the variety that the modern beer geek demands: this was the point of this year's rebranding, replacing Broken Halo with the Rotator IPA series, the yearly "W" releases with the more flexible Series 924 four-packs, and continuing the occasional Brothers Reserve bombers. Red Hook is the part of the portfolio I feel a little sorry for. This is its 30-year anniversary, and while it was a big fish in a small pond decades ago, the company has all but relegated it to downmarket status. In Marketingese, Red Hook is sold on its "unique big personality": the company describes it as "edgy" and "approachable", not as delicious and high-quality. One interesting thing I learned at the meeting is that CBA really is paying attention to the blogosphere. 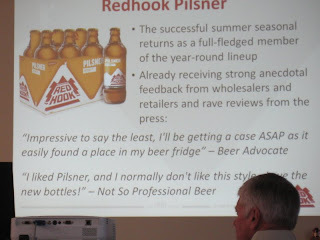 The Power Point slides had no fewer than three quotes from Brady's analysis of the Widmer makeover, and one quote from Sanjay's review of Red Hook Pilsner. No quotes from It's Pub Night, but I was surprised that the Director of Investor Relations -- whom I hadn't met before yesterday -- called me by name on the street before the meeting as I wandered toward the wrong entrance. Guess I'm not as incognito as I thought I was. In terms of the stock, this has been a good year. The price has nearly tripled in the last twelve months. The sale of CBA's stake in Goose Island brought in a nice cash windfall for the company. And the business page editors at the Oregonian have been roused from their four-year slumber and finally added HOOK to their table of Stocks of Local Interest. Last June I listed several risks you might consider if you were thinking about buying stock in the CBA (if you are thinking of such an investment, do read that article). I received a first-hand lesson in those risks when I took the plunge. Here's how it happened. Last August, with the share price threatening $5, I decided to take a gamble in an IRA account and buy 100 shares. Because so few shares are traded, and because I placed my order late on a Friday, the brokerage only filled part of my order that day. I was the proud owner of a mere 15 shares, meaning the $9 commission had effectively added 60¢ to the $4.93 share price. Dammit! That's like losing 12% on your investment immediately. The following Monday I was able to get a full 100 shares for $4.95 apiece, though there were some tense moments as I watched the purchase get pieced together in chunks of 4 shares, 6 more, 7 more, wondering if I had just bought another expensive 17 shares, until the final 83 came through. Moral for the small investor: bid at or above the ask price, and buy early in the day. Very cool! Do you recall what they quoted from my review? I liked Pilsner, but rated it 3 out of 5 stars. It wasn't exactly a glowing review. Bill - Fill it or kill it if you're worried about paying more than one commission on a low priced stock. Joe: On the second day I tried both Fill or Kill and Do Not Reduce, but I seem to recall that my online brokerage wouldn't let me do either for my tiny order of 100 HOOK. Or maybe at every price I named close to the Ask, it got killed immediately with Fill or Kill. I eventually just named something a little above the ask and hoped for the best. The feds are going to shut you down, man! Writing about and owning a brewery? All I can say is: run when you see the guys in suits and Ray-Bans. I think that's the smile of "Who let this guy with dirty jeans and a cheap camera into the shareholders meeting?". Censorship is the first nail in the coffin of Democracy and Free Speech. - "Fill Or Kill" failed every time I tried it, even with prices/quantities that appeared to be hanging in the "ask" table. Probably HOOK is too thinly traded. - "Do Not Reduce" orders are only available on "Good Until Canceled", not 1-day orders. - "All Or None" at the ask price succeeded immediately, but I had to buy at least 200 shares to use that condition. Not sure why this worked when fill-or-kill wouldn't succeed.